The stone Pietersite is extremely rare. There are just two known deposits on planet earth. This ultra rare stone possesses a dramatic, stormy swirl of colors. It is truly a remarkable stone that’s perfect for men who feel deeply but make their moves logically. 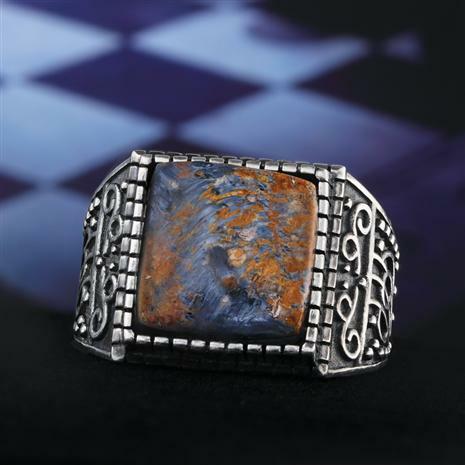 The Chessman’s Ring features a single, large Pietersite stone, designed for men who know how to control the board. The stone weighs six carats and has been expertly cut into the shape of a chess square, and set in an intricately-detailed 925 sterling silver ring with an antiqued finish. Pietersite’s rarity means some retailers are selling men’s Pietersite jewelry for around $1,000, but Stauer strategically acquired our supply way below what others are paying, so now we can make you king of the board for $99.